A couple boys fish off the beach at Placencia, Belize, during the End of the World Marathon on Dec. 8, 2013. I paused long enough at mile 24 or so to take this photo. Perhaps “Powered by Pina Coladas” is not the best approach for a marathon. Or then again, maybe it is. It depends on the marathon. And your goals. In my case, the End of the World Marathon in Placencia, Belize, was a cap to my racing year. I’d completed an ultramarathon in the spring. I’d made my attempt at what for me was a fast marathon in the fall. 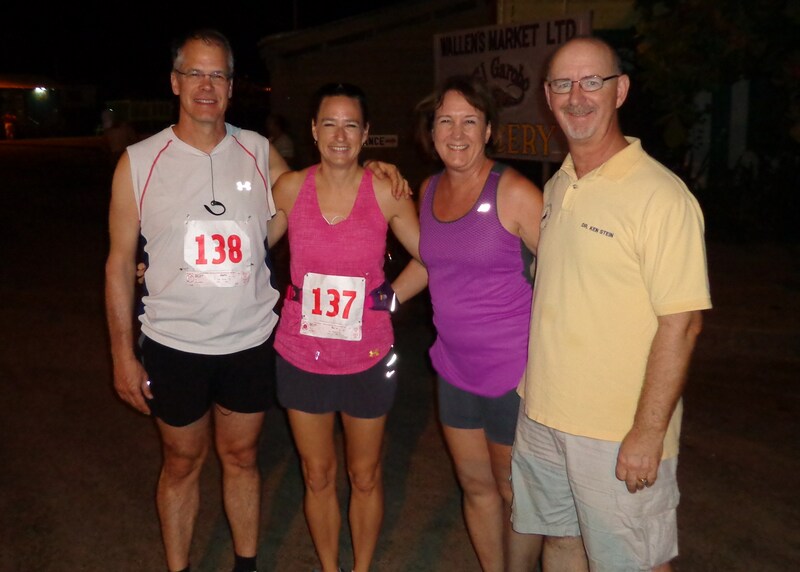 The run in Belize on Dec. 8, 2013, was a chance to combine a warm weather adventure with one of my favorite pastimes. It didn’t disappoint on either account. I’ll write up my thoughts about Placencia in general in a future post. In this post, I want to share a little about the End of the World Marathon. 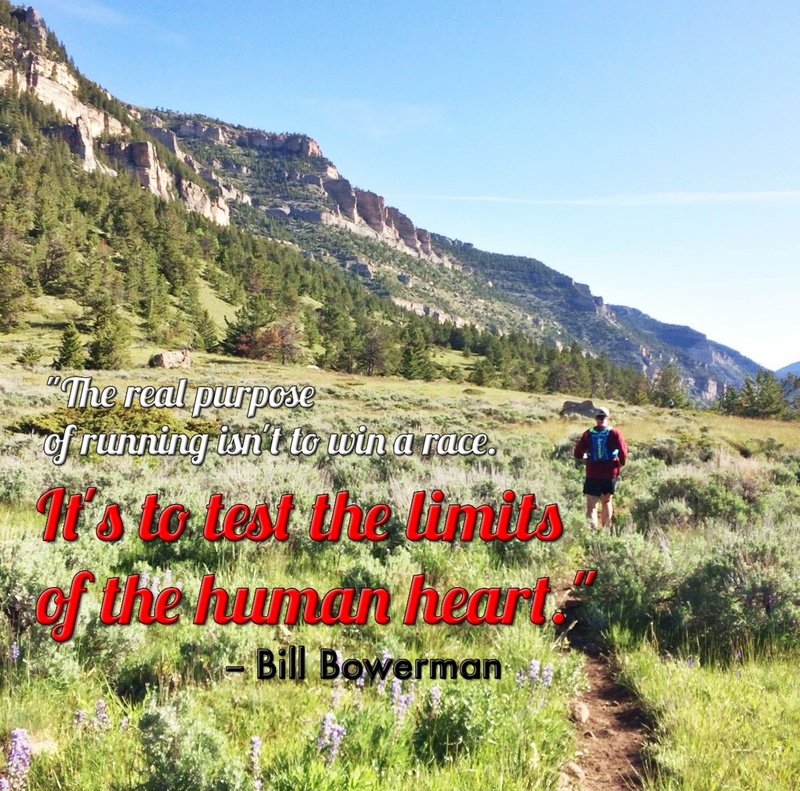 This spring, I marked my 50th birthday with a special challenge, running my first ultramarathon. As my wife, Barb, approached the same milestone, she decided she’d like to run another marathon (because she’s only half as crazy as me). And she wanted to combine that physical challenge with an exotic locale. Enter Placencia, Belize. 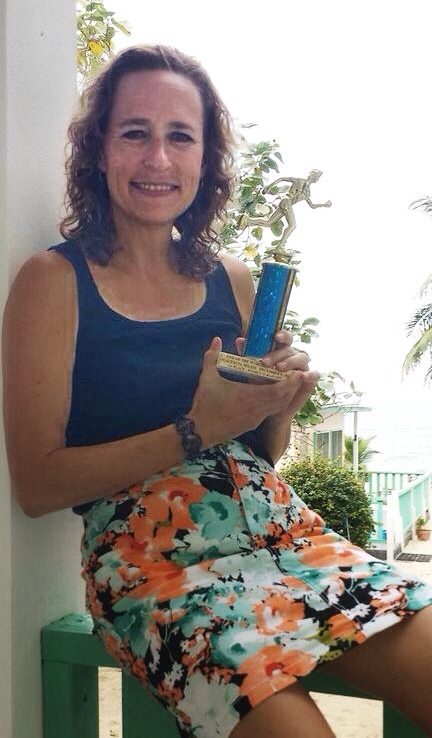 Barb proudly displays her trophy for winning her age group in the End of the World Marathon. Way to go, Barb! Barb’s approach to the EOW marathon was different than mine. It was her big challenge. She wanted to not just meet the challenge but beat the challenge. And, boy, did she, winning her age division for the women’s marathon. Me, not so much. I bumbled and stumbled my way to my slowest marathon yet. But the fault for the sub-par race time rested with me, not with the race itself. This was just the second running of the End of the World Marathon, but it was well organized and well supported. Organizer Chip Lovett splits his time between the States and Belize, but he answered a number of pre-race questions by email and offered us lots of great advice on the area. At the packet pickup the day before the race, Chip and his volunteers were friendly and cordial. And at the post-race celebration, Chip and several sponsors handed out beers and trophies, all to a reggae beat supplied by the entertaining local DJ. 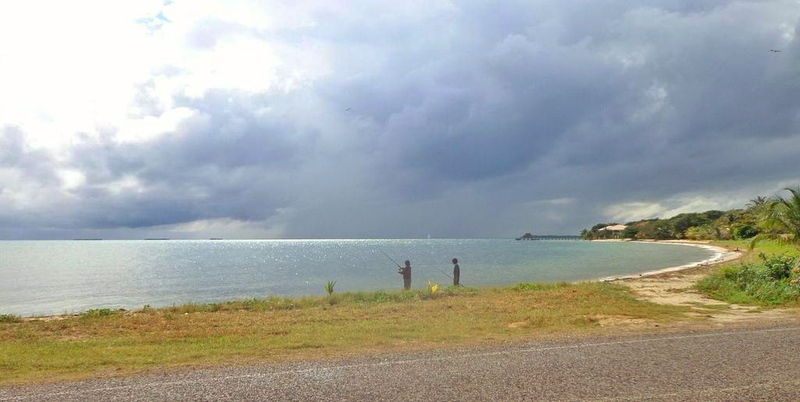 The race traces nearly the entire length of the Placencia Peninsula, which is about 16 miles long and located in far southern Belize. At some points, the peninsula is just yards wide, with the Caribbean Sea to the east and the Placencia Lagoon to the west. The medal’s colors fit perfectly with the Caribbean vibe. The marathon started at the south end of the peninsula at Placencia village. 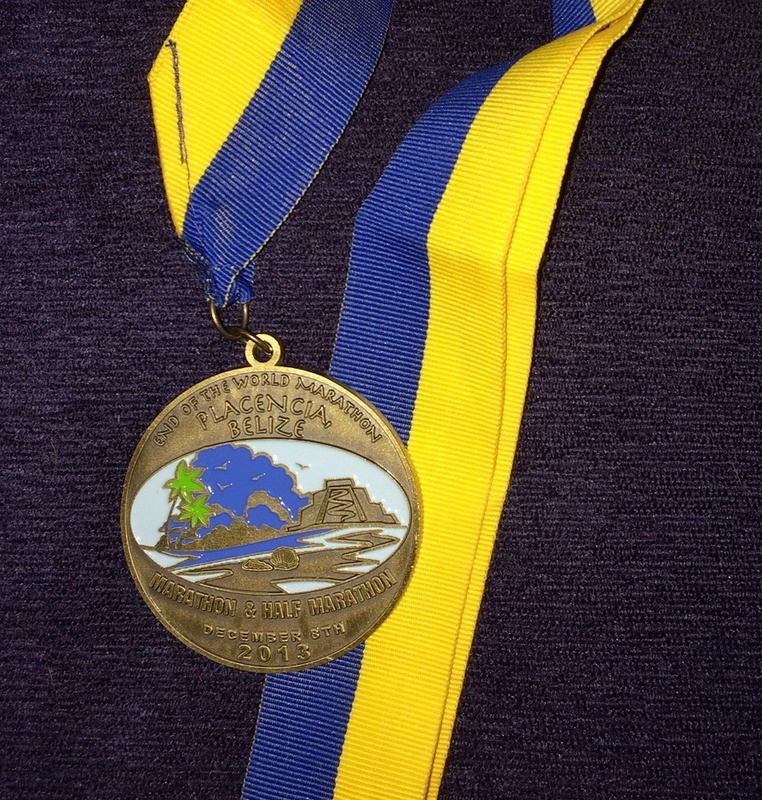 It ran an out-and-back course along the peninsula to reach the necessary 26.2 miles. For the half marathon, participants were picked up by bus all the way along the route and taken to the north end. From there, they ran back to Placencia. It was fun to meet the half-marathoners as we marathoners made our way to the north. The race is run on the blacktop road that is the main artery for the peninsula. Traffic control on the road is accomplished by speed humps, which also serve as the high elevation points on the peninsula. If you equate “flat” with “fast,” this is the race for you. And if you’re sick of running in the cold and the snow, Belize in December is the place to be. The race started at 5:30 a.m. — a little more than a half hour before sunrise — and it was 70 degrees or so already. By the time I finished, the temperature had risen to 85 degrees. The temperature topped out at 90 degrees on race day. Fortunately, the morning was overcast and there were passing showers; if the sun comes out, even the morning can get quite warm. Marathoners Mark and Barb Smidt, from left, take a photo with their own personal support crew, Kristi and Ken Stein, before the start of the race. Thanks, Ken and Kristi, for all your help along the way! As an Iowan, I’m used to the humidity that helps us grow bumper crops of corn. But I’m not used to high humidity and high temps in the winter. During our visit to Placencia, the humidity ranged from 70-95 percent — when it wasn’t outright raining. This year, there were 35 finishers in the marathon and 134 finishers in the half-marathon. That’s roughly double the numbers from the inaugural race. After running a few mega races over the years, it was fun to do a small run. Despite the small number of participants, the locals came out in large numbers — relatively speaking — to support the runners. They enthusiastically cheered at several aid stations. One woman cheered on every passing runner from the balcony of her Placencia villa. There were a number of aid stations at timely locations. Water was actually passed out in small plastic bags — about 8-10 ounces in size. Gatorade and even coconut water was handed out in some places. Bananas and orange slices were plentiful, and Gu was distributed in a few spots. 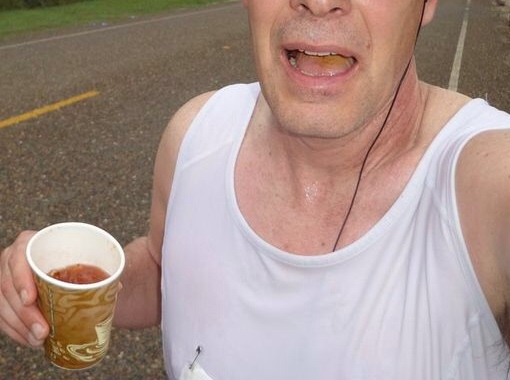 Perhaps one of the world’s worst and least flattering selfies, but what do you expect when you are taking a picture of yourself while drinking a Bloody Mary at mile 16 of a marathon? The aid station volunteers at the Maya Beach Hotel and Bistro got the prize for most enthusiastic. They brought to life a circus theme, dressing as penguins, lions, the ring master and the like. And they CHEERED. Coming at mile 16 or so, their enthusiasm was really welcome. And their unique hydration offering got the best of me. “How about a Bloody Mary?” one costumed volunteer asked. I’m sure it didn’t help my finishing time. But it certainly added to the experience. Better runners through circumcision as young adults? Watch the YouTube video above of Kenyan runner Kipchoge Keino win the 1,500 meter race in the 1968 Olympics. Keino’s victory marked the beginning of nearly 50 years of Kenya’s dominance in long-distance running. Many scholars and scientists have sought the answer to the question: Why are Kenyans such great long-distance runners? In it’s own inimitable style, Radiolab tackles that question in this podcast. You can read books on the subject, you can read magazine articles on it, but this 25-minute podcast is worth your time. But perhaps the most dramatic — and, for me, headline grabbing — reason for the Kalenjin success is their self-nurtured ability to withstand pain. Faced with an extremely taxing and painful rite of passage shortly after puberty, Kalenjin children spend years preparing themselves for the ordeal. And since the ordeal includes a unique manner of circumcision, it’s easy to understand how the Kalenjin can endure the pain of a measly marathon. Give the podcast a listen. I guarantee you’ll be enlightened and entertained. With 8 weeks to go to my first ultramarathon, this probably wasn’t the time to be watching a video that details how too much exercise may not good for your heart health. But if you’re a long-distance runner, the video above is worth 18 minutes of your time. For runners, the speaker carries a extra level of credibility: he’s also a former triathlete and a life-long runner. O’Keefe also references New Orleans’ physician Carl Lavie, whose work stressing fit over fat I referenced in an earlier blog. In his TEDx presentation, O’Keefe doesn’t urge us to give up running. But he suggests that the greatest benefits come from running a a few miles at a time at a moderate pace just a a few times a week. And he presents some evidence that extreme training and running has negative consequences for our cardiac health. Anecdotally, O’Keefe points to Micah True — featured prominently in the best-seller “Born to Run” — as an example of what happens when we overtrain. This story explains the cardiac distress that killed True. O’Keefe isn’t the only one who has suggested that extreme exercise may decrease your life span. I listen to a podcast by Ben Greenfield, an expert on nutrition, exercise and endurance sports, and he has said that he figures his extreme exercise marginally lowers his life span. But he also points out that sometimes we do things we love but aren’t good for us. But for now, I’ll relish the physical challenge and the mental boost I get from endurance training and competitions. It seems like I began training for my ultramarathon in earnest this weekend. Over the past few weeks, I’ve been building my mileage as I normally would. I’ve stuck to four runs a week with some speed work during the work week and a long run on the weekend. At some point, I may add another midweek run in order to build mileage even more, but it’s been better for the aches and pains to stay with four runs a week. I have lengthened my two midweek runs further than I normally would for marathon training. This week, I did a pair of 7-milers on Tuesday and Thursday. If I’m going to tackle an ultra, I’ll need more mileage under my belt. Getting in extra miles during an Iowa winter means not letting a little snow or ice stop you. Here, I’ve added 5/8th-inch sheet metal screws to the bottom of some of my older running shoes. But the biggest change from my usual training plan came on my weekend runs. I have made two key changes: 1) I’ve lengthened the pair of runs, and 2) I’ve moderated the pace. I actually ran my longest run on Saturday instead of Sunday, but that change had more to do with the weather. The forecast called for the temperatures to drop all weekend, so I did a 15-miler in the mid-30s on Saturday and a 6-miler on Sunday with temps in the teens. I’ll continue to combine back-to-back long runs on Saturdays and Sundays, working up to a 3-hour run on Saturday and a 4-hour run on Sunday. I may need to go further than that, but for now, those are the times/distances I have planned. My second change was in my approach to the longest run. Instead of running at a constant pace for the entire run, I alternated 5-minute run segments with 1-minute walk segments. This keeps the body fresher longer. And that certainly seemed to be the case Saturday, when I still felt pretty darn good at the end of the 15 miles. The run-walk method is used by some marathoners, and promoter Jeff Galloway says many runners can finish faster with this approach instead of the steady state approach. But for ultramarathoners, the key is to feel good for as long as you can. Many runners will use the run-walk method and walk up any hill. After all, unless you are an elite runner, the goal is to survive and keep moving forward. The run-walk will test my patience. On Saturday, I just wanted to keep going, make some progress, get that much closer to done. I had to keep telling myself to be patient. But that will be key for a 10- or 12-hour ultramarathon effort. I still haven’t totally committed to an ultra. My mileage is a bit behind where it should be, and I’m always wary of reaggravating my hamstring. If I have to rest that for any length of time, my timing will be shot. There aren’t many ultras around, and I’ve found one only a couple hours away in Illinois in early April. The Potawatomi Trail Run 50 looks like a fun race, so even if my planning isn’t perfect, that’s the race I’m aiming for. I wish it was a bit later, but it is what it is. And the new challenge has me jazzed. I’m looking at my training from a new perspective and learning all kinds of new things. So I’ll hope for steady progress over the next weeks. All in all, 2012 was a good year for running. I logged 1,174 miles in 2012, which was nearly a 40 percent increase from the 845 miles logged in 2011. Since I had set a goal of topping 1,000 miles at the beginning of the year, I was pleased. As you might expect, my average run distance increased, jumping to nearly 7 miles from 5.3 miles. My overall average pace was a bit slower, which shouldn’t be too surprising since the run distance increased. But on the brighter side, the average pace for a run under 6 miles was a bit faster. The last few miles were tough, but the feeling was sweet at the finish line of the Rock and Roll New Orleans Marathon. A nagging hamstring injury had kept me out of marathons for three years, but in 2011 and 2012, I learned how to manage the problem a bit better. This year, I rarely ran more than 4 times a week. And when the hamstring bothered me, I’d take extra time off, backing off for a week or two several different times throughout the year. If you are smart, when you get older, you realize that you can no longer just power through an injury. That’s been a tough lesson for me. I was able to run three marathons in 2012. New Orleans in March was the highlight, setting a new PR. I ran my first trail marathon in September, although I should have stuck to the plan and made the run just another training day. And I ran the Des Moines marathon in October. After a high in the spring, the fall was actually a downer. My times in the September and October races stunk, and I really had high hopes heading into Des Moines. But I learned a couple lessons: you can overtrain and you need to leave room for a taper. I had been toying with the idea of an ultramarathon for my birthday in early 2013 — 50 miles on the 50th birthday had a nice ring to it. But that won’t happen. I needed to take some time off after the October race, and I haven’t ramped it up enough to make 50 miles in just a few weeks. But I may still log the 50 miles in my 50th year. Despite the highs and lows, it’s been a blast. I’m thankful that I’m healthy enough to run. I love being outside, whether it’s 15 degrees or 90 degrees, whether it’s a sunny Sunday morning in May or a dark Tuesday night in December. I can watch the eagles along the Mississippi River and the turkeys in the nearby woods. It’s fun to travel to races around the country, to see new places and to cut loose with family and friends. But there’s also a special satisfaction in lacing up the trainers, relieving some stress on the roads around Keokuk and simply reveling in the workout. How were your workouts in 2012 and what do you have planned for 2013?